That is REALLY interesting. Twice at Lincoln Park I’ve come across raccoon carcasses for which eviscerated doesn’t even begin. Little more than a string of gut and a tail We’ve always assumed it was coyote kill. If this coyote either runs from or tries to make friends with cats, well who knows. Further indication that they are indeed individuals. They are indeed individuals with their own personalities — I’ve been observing and studying their individuality for 11 years now. 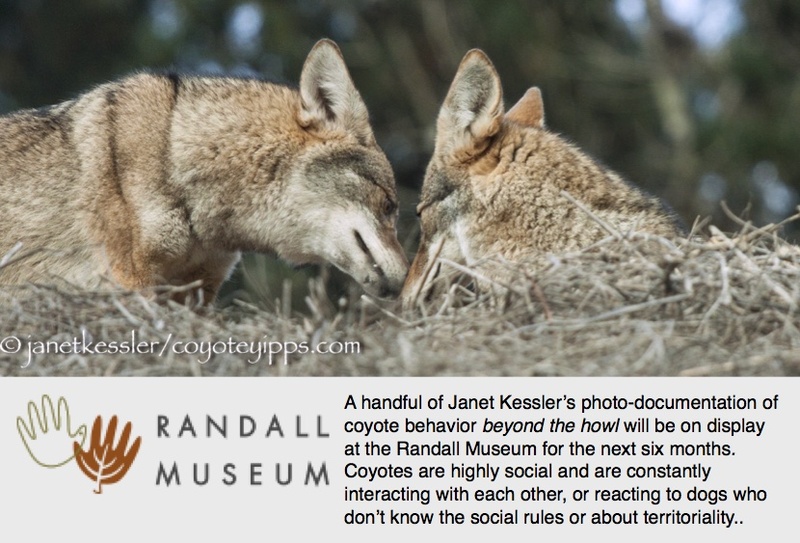 My exhibit in Sausalito has a summarizing text panel about it. Fascinating! Maybe a coyote and opossum being friends is not so far-fetched! Let’s keep our eyes open for it! However, remember that an opossum would probably play dead rather than interact; and since coyotes eat carrion, the defense wouldn’t work, would it? The coyote might just dig in!